Download "POLICY SUMMARY. OVER 50s LIFE INSURANCE PLANS"
1 OVER 50s LIFE INSURANCE PLANS POLICY SUMMARY. 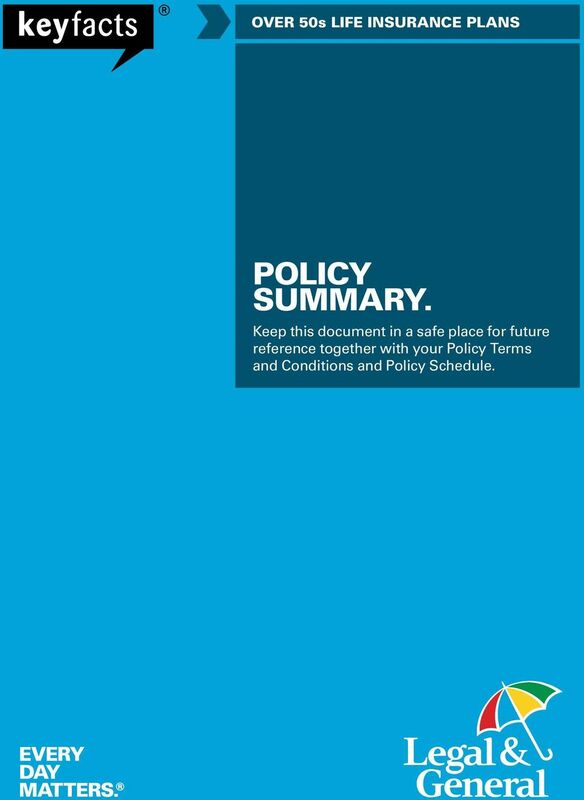 Keep this document in a safe place for future reference together with your Policy Terms and Conditions and Policy Schedule. 2 2 POLICY SUMMARY 1. INCREASING PLAN. 2. FIXED PLAN. 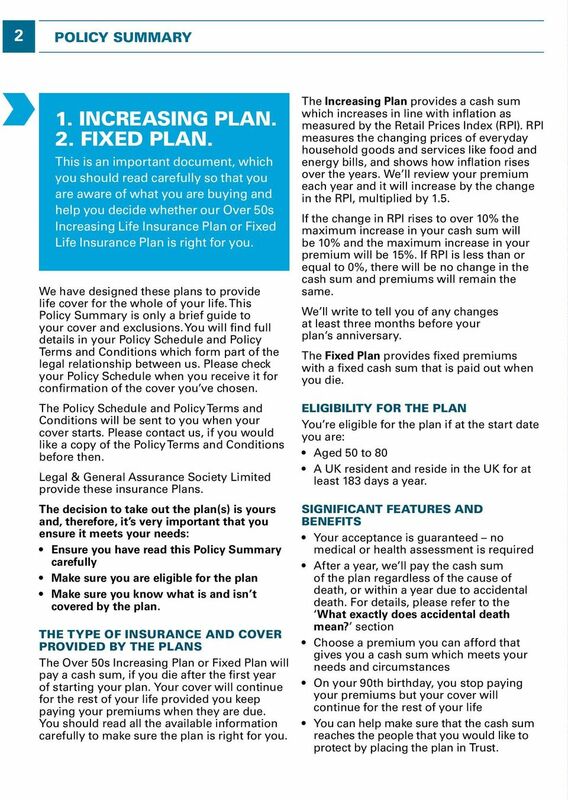 This is an important document, which you should read carefully so that you are aware of what you are buying and help you decide whether our Over 50s Increasing Life Insurance Plan or Fixed Life Insurance Plan is right for you. We have designed these plans to provide life cover for the whole of your life. This Policy Summary is only a brief guide to your cover and exclusions. You will find full details in your Policy Schedule and Policy Terms and Conditions which form part of the legal relationship between us. Please check your Policy Schedule when you receive it for confirmation of the cover you ve chosen. The Policy Schedule and Policy Terms and Conditions will be sent to you when your cover starts. Please contact us, if you would like a copy of the Policy Terms and Conditions before then. Legal & General Assurance Society Limited provide these insurance Plans. The decision to take out the plan(s) is yours and, therefore, it s very important that you ensure it meets your needs: Ensure you have read this Policy Summary carefully Make sure you are eligible for the plan Make sure you know what is and isn t covered by the plan. THE TYPE OF INSURANCE AND COVER PROVIDED BY THE PLANS The Over 50s Increasing Plan or Fixed Plan will pay a cash sum, if you die after the first year of starting your plan. Your cover will continue for the rest of your life provided you keep paying your premiums when they are due. You should read all the available information carefully to make sure the plan is right for you. The Increasing Plan provides a cash sum which increases in line with inflation as measured by the Retail Prices Index (RPI). RPI measures the changing prices of everyday household goods and services like food and energy bills, and shows how inflation rises over the years. We ll review your premium each year and it will increase by the change in the RPI, multiplied by 1.5. If the change in RPI rises to over 10% the maximum increase in your cash sum will be 10% and the maximum increase in your premium will be 15%. If RPI is less than or equal to 0%, there will be no change in the cash sum and premiums will remain the same. We ll write to tell you of any changes at least three months before your plan s anniversary. The Fixed Plan provides fixed premiums with a fixed cash sum that is paid out when you die. ELIGIBILITY FOR THE PLAN You re eligible for the plan if at the start date you are: Aged 50 to 80 A UK resident and reside in the UK for at least 183 days a year. SIGNIFICANT FEATURES AND BENEFITS Your acceptance is guaranteed no medical or health assessment is required After a year, we ll pay the cash sum of the plan regardless of the cause of death, or within a year due to accidental death. For details, please refer to the What exactly does accidental death mean? 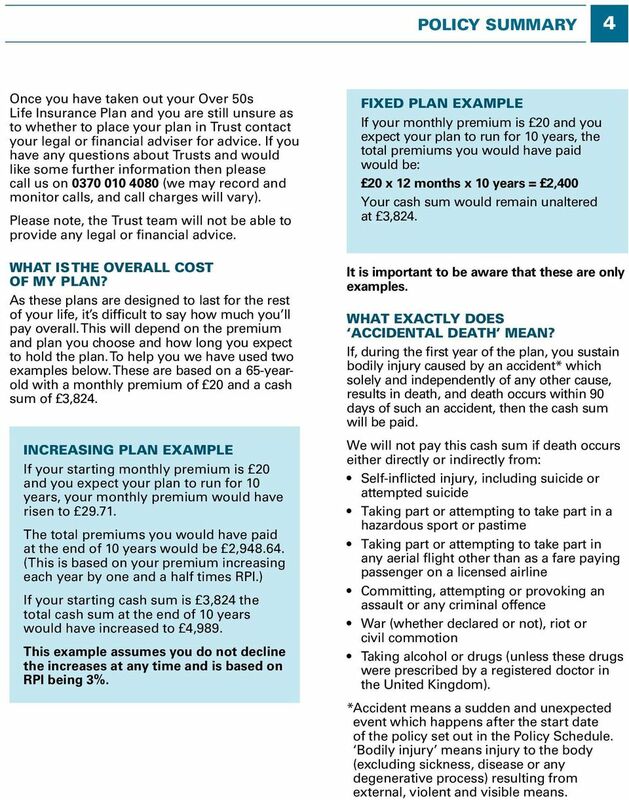 section Choose a premium you can afford that gives you a cash sum which meets your needs and circumstances On your 90th birthday, you stop paying your premiums but your cover will continue for the rest of your life You can help make sure that the cash sum reaches the people that you would like to protect by placing the plan in Trust. 3 POLICY SUMMARY 3 ADDITIONAL FEATURES AND BENEFITS FOR INCREASING PLAN: Your cash sum will be reviewed each year in line with the change in RPI Following the annual plan review you can choose to decline the increase in your cash sum and premium. If you do, your cash sum and premium will remain fixed at that value. 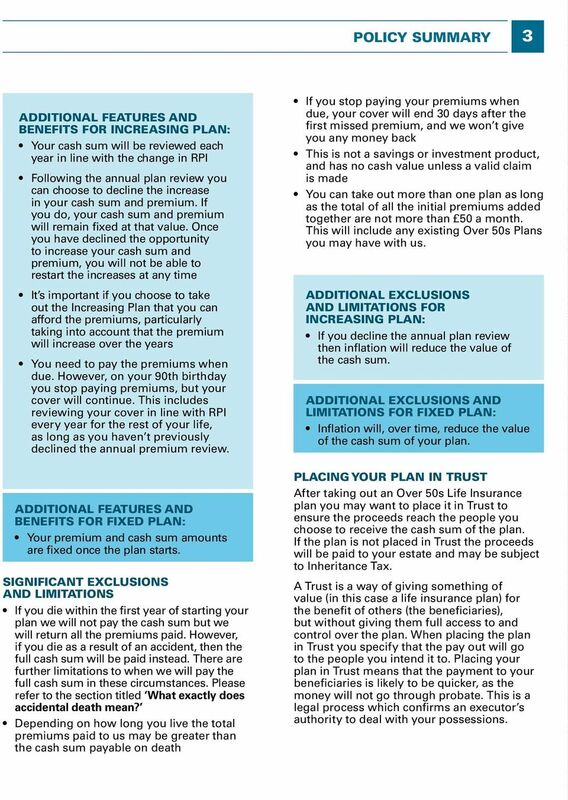 Once you have declined the opportunity to increase your cash sum and premium, you will not be able to restart the increases at any time It s important if you choose to take out the Increasing Plan that you can afford the premiums, particularly taking into account that the premium will increase over the years You need to pay the premiums when due. However, on your 90th birthday you stop paying premiums, but your cover will continue. This includes reviewing your cover in line with RPI every year for the rest of your life, as long as you haven t previously declined the annual premium review. ADDITIONAL FEATURES AND BENEFITS FOR FIXED PLAN: Your premium and cash sum amounts are fixed once the plan starts. SIGNIFICANT EXCLUSIONS AND LIMITATIONS If you die within the first year of starting your plan we will not pay the cash sum but we will return all the premiums paid. However, if you die as a result of an accident, then the full cash sum will be paid instead. There are further limitations to when we will pay the full cash sum in these circumstances. Please refer to the section titled What exactly does accidental death mean? Depending on how long you live the total premiums paid to us may be greater than the cash sum payable on death If you stop paying your premiums when due, your cover will end 30 days after the first missed premium, and we won t give you any money back This is not a savings or investment product, and has no cash value unless a valid claim is made You can take out more than one plan as long as the total of all the initial premiums added together are not more than 50 a month. This will include any existing Over 50s Plans you may have with us. ADDITIONAL EXCLUSIONS AND LIMITATIONS FOR INCREASING PLAN: If you decline the annual plan review then inflation will reduce the value of the cash sum. ADDITIONAL EXCLUSIONS AND LIMITATIONS FOR FIXED PLAN: Inflation will, over time, reduce the value of the cash sum of your plan. PLACING YOUR PLAN IN TRUST After taking out an Over 50s Life Insurance plan you may want to place it in Trust to ensure the proceeds reach the people you choose to receive the cash sum of the plan. If the plan is not placed in Trust the proceeds will be paid to your estate and may be subject to Inheritance Tax. A Trust is a way of giving something of value (in this case a life insurance plan) for the benefit of others (the beneficiaries), but without giving them full access to and control over the plan. When placing the plan in Trust you specify that the pay out will go to the people you intend it to. Placing your plan in Trust means that the payment to your beneficiaries is likely to be quicker, as the money will not go through probate. This is a legal process which confirms an executor s authority to deal with your possessions. 4 POLICY SUMMARY 4 Once you have taken out your Over 50s Life Insurance Plan and you are still unsure as to whether to place your plan in Trust contact your legal or financial adviser for advice. If you have any questions about Trusts and would like some further information then please call us on (we may record and monitor calls, and call charges will vary). Please note, the Trust team will not be able to provide any legal or financial advice. WHAT IS THE OVERALL COST OF MY PLAN? As these plans are designed to last for the rest of your life, it s difficult to say how much you ll pay overall. This will depend on the premium and plan you choose and how long you expect to hold the plan. To help you we have used two examples below. These are based on a 65-yearold with a monthly premium of 20 and a cash sum of 3,824. INCREASING PLAN EXAMPLE If your starting monthly premium is 20 and you expect your plan to run for 10 years, your monthly premium would have risen to The total premiums you would have paid at the end of 10 years would be 2, (This is based on your premium increasing each year by one and a half times RPI.) If your starting cash sum is 3,824 the total cash sum at the end of 10 years would have increased to 4,989. This example assumes you do not decline the increases at any time and is based on RPI being 3%. FIXED PLAN EXAMPLE If your monthly premium is 20 and you expect your plan to run for 10 years, the total premiums you would have paid would be: 20 x 12 months x 10 years = 2,400 Your cash sum would remain unaltered at 3,824. It is important to be aware that these are only examples. WHAT EXACTLY DOES ACCIDENTAL DEATH MEAN? If, during the first year of the plan, you sustain bodily injury caused by an accident* which solely and independently of any other cause, results in death, and death occurs within 90 days of such an accident, then the cash sum will be paid. We will not pay this cash sum if death occurs either directly or indirectly from: Self-inflicted injury, including suicide or attempted suicide Taking part or attempting to take part in a hazardous sport or pastime Taking part or attempting to take part in any aerial flight other than as a fare paying passenger on a licensed airline Committing, attempting or provoking an assault or any criminal offence War (whether declared or not), riot or civil commotion Taking alcohol or drugs (unless these drugs were prescribed by a registered doctor in the United Kingdom). * Accident means a sudden and unexpected event which happens after the start date of the policy set out in the Policy Schedule. Bodily injury means injury to the body (excluding sickness, disease or any degenerative process) resulting from external, violent and visible means. 5 POLICY SUMMARY 5 CANCELLATION RIGHTS After we have accepted your application, we will send you notice of your right to cancel. We then give you 30 days to change your mind about starting your plan. If you do change your mind, you need to send this notice back to us at: Life Premium Collections Cancellations, Legal & General Assurance Society Limited, City Park, The Droveway, Hove, East Sussex BN3 7PY. We will then cancel your plan and refund any premiums paid. After this period you can cancel your plan at anytime by writing to us at the same address as above. HOW TO MAKE A CLAIM In the event of death, a claim can be made by contacting us on We may record and monitor calls. Or please write to us at: Claims Department, Legal & General Assurance Society Limited, City Park, The Droveway, Hove, East Sussex BN3 7PY. To enable us to process your claim we may need the following: The Policy Schedule The death certificate The name of the person making the claim and their entitlement to the cash sum (i.e. as next of kin or executor of the estate). When we have received the above we will advise of any further requirements. HOW TO MAKE A COMPLAINT If you wish to complain about any aspect of the service you have received from us, or you would like us to send you a copy of our internal complaint handling procedure, please contact our Helpdesk on We may record and monitor calls. Call charges will vary. Alternatively you can write to us at: Complaints Department, Legal & General Assurance Society Limited, Knox Court, 10 Fitzalan Place, Cardiff CF24 0TL. 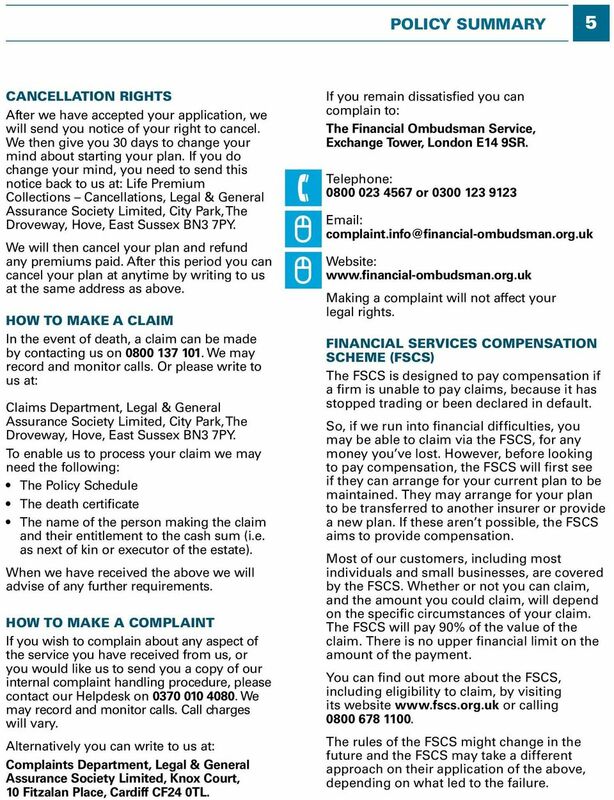 If you remain dissatisfied you can complain to: The Financial Ombudsman Service, Exchange Tower, London E14 9SR. Telephone: or Website: Making a complaint will not affect your legal rights. FINANCIAL SERVICES COMPENSATION SCHEME (FSCS) The FSCS is designed to pay compensation if a firm is unable to pay claims, because it has stopped trading or been declared in default. So, if we run into financial difficulties, you may be able to claim via the FSCS, for any money you ve lost. However, before looking to pay compensation, the FSCS will first see if they can arrange for your current plan to be maintained. They may arrange for your plan to be transferred to another insurer or provide a new plan. If these aren t possible, the FSCS aims to provide compensation. Most of our customers, including most individuals and small businesses, are covered by the FSCS. Whether or not you can claim, and the amount you could claim, will depend on the specific circumstances of your claim. The FSCS will pay 90% of the value of the claim. There is no upper financial limit on the amount of the payment. You can find out more about the FSCS, including eligibility to claim, by visiting its website or calling The rules of the FSCS might change in the future and the FSCS may take a different approach on their application of the above, depending on what led to the failure. This is an important document, which you should read carefully so that you understand what you are buying. Please keep together with your Policy Terms and Conditions, in a safe place, for future reference. Policy Summary. Please print this document and keep in a safe place for future reference with your Policy Terms and Conditions and Policy Schedule. KEY FEATURES AND POLICY TERMS AND CONDITIONS. KEY FEATURES OF THE RELEVANT LIFE PLAN. Key Features of the Whole of Life Protection Plan. INSURANCE KEY FEATURES OF: INCOME PROTECTION BENEFIT PLAN. This is an important document which you should keep in a safe place. INSURANCE KEY FEATURES OF: BUSINESS PROTECTION PLANS. This is an important document which you should keep in a safe place. INSURANCE KEY FEATURES OF: FAMILY PROTECTION PLANS MORTGAGE PROTECTION PLANS. This is an important document which you should keep in a safe place. INSURANCE KEY FEATURES OF: MORTGAGE PROTECTION PLANS. This is an important document which you should keep in a safe place. KEY FEATURES. SELECT PORTFOLIO BOND (WEALTH MANAGERS) This is an important document. Please keep it safe for future reference. KEY FEATURES OF: MORTGAGE PROTECTION PLANS. This is an important document which you should keep in a safe place. AIG Life Over 50s Life Plan Key Facts Welcome to AIG American International Group, Inc. (AIG) is a leading international insurance organisation serving customers in more than 130 countries and jurisdictions. POLICY SUMMARY. 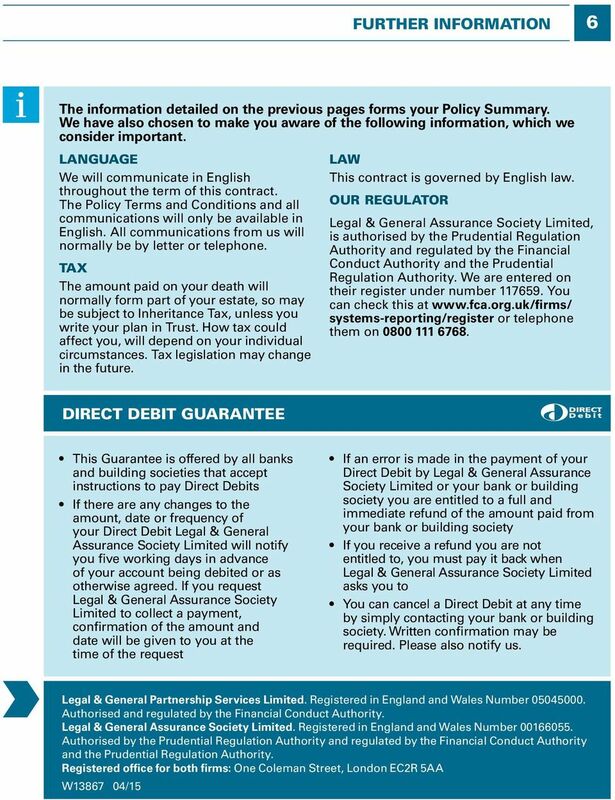 This policy is provided by Legal & General Assurance Society Limited. OVER 50s LIFE INSURANCE. OVER 50s LIFE INSURANCE MORE THAN A MEMORY. Key facts of AA Life Insurance Provided by Friends Provident AA Life Insurance AA Life Insurance AA Life Insurance is provided by Friends Provident. We, us and our in this document mean Friends Provident. please read and keep this in a safe place in case you need it later. key features of the income Protection Benefit PlAn. KEY FEATURES OF LEGAL & GENERAL S PENSION ANNUITY. FLEXIBLE MORTGAGE ISA PLAN KEY FEATURES. FOR AN ADDITIONAL PLAN. This is an important document. Please keep safe for future reference. Q Card Accidental Death Cover Policy Wording Q Card Accidental Death Cover Policy Wording 1. Introducing your Policy 2. What you re covered for 3. What you re not covered for 4. How to make a claim 5. KEY FEATurES of LEGAL & GEnErAL S PEnSIon AnnuITIES. seeing retirement differently seeing retirement differently RELEVANT LIFE PLAN CELEBRATING CELEBRATING YEARS sin ce 1 9 9 5 YEARS sin ce 1 9 9 5 The Financial Conduct Authority is a financial service regulator. Key features of Zurich Accidental Death Cover Contents Helping you decide This important document gives you a summary of Zurich Accidental Death Cover. Please read this and keep it for future reference. Immediate Vesting Personal Pension Plan Key features This is an important document. Please read it and keep for future reference. The Financial Conduct Authority is the independent financial services regulator. MORTGAGE AND FAMILY PROTECTION PLANS KEY FEATURES OF THE MORTGAGE AND FAMILY PROTECTION PLANS. Legal & General Protection Plans Key Features of the Mortgage and Family Protection Plans and THE Family and Personal Income Plans. This is an important document which you should keep in a safe place. AIG Life Over 50s Life Plan Plan Details Welcome to AIG American International Group, Inc. (AIG) is a leading international insurance organisation serving customers in more than 130 countries and jurisdictions.